Women’s Fashion: 8 Essential Fall Trends You Need to Know! It’s August and you’re starting to realize that we’re coming toward the end of summer – yikes, is it that time of the year already?? Sure, we’ll continue to have warm weather until the end of September BUT it’s that one month – September. September signals change. This month sparks thoughts of kids going back to school, you getting back into the grind & returning to the ‘real world’, and prepping for…that’s right…the fall season. As you begin the transition from a relaxing summer into fall, one of the things that runs across your mind is “What Do I Wear?” The thought of turning over into an updated fall wardrobe might give you anxiety – I admit, feel it sometimes too! But, thankfully, it won’t be too difficult this time around and here’s why. I’m hooking you up with the key women’s fashion trends that you need to prepare your wardrobe. I’ve sourced top fashion influencers such as Who What Wear, Women's Wear Daily, and Neiman Marcus to bring you the latest and greatest so that you don’t have to fret about what to include in your closet this season. (You can also out my video highlighting these Fall 2016 Trends). Love These Looks? Want These Looks? Click image for purchasing info! Pantsuits – It’s no surprise that pantsuits are making a comeback this fall as they’re a staple of Presidential candidate, Hillary Clinton. While conservative looks are apropos for the campaign trail or the board room, you can liven up your personal selection with bolder colors and patterns that are trending right now such as tans and golds. Velvet – Yes, velvet is back!!! This rich, lush fabric is a perfect complement to the fall season. But here’s the interesting thing – velvet is making an appearance not only in clothes, but also shoes, handbags, and wallets! Step out in style and incorporate velvet into your fall fashion routine. Embellished Sweaters – Put your traditional cable knit sweaters aside this season and make room in your closet for tricked out sweaters that are embellished with leather, fur, and fringe! 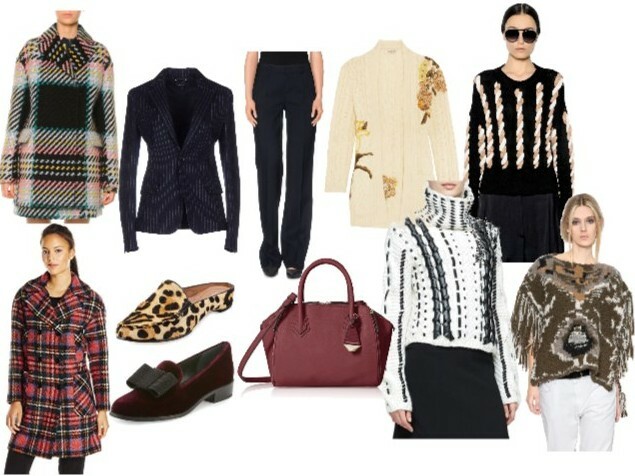 This season we’re seeing lots of fun accents bringing sweaters to life. This is a great way to add some personality to your wardrobe while looking stylish. Plaid Overcoats – Dark, muted colors are a thing of the past when it comes to outwear this season. Step up your game with overcoats that have pops of color with fun, plaid designs. Bold Tailoring & Texture Mashups – The hottest looks this season feature mashups of different fabrics such as wool, cashmere, silk, and cotton. What’s more is that the tailoring is quite bold in terms of cut, proportion, and volume. Another great way to add some punch to your wardrobe! Slides & Mules – Let’s not forget about shoes! Popular pointy-toed slides and mules are transitioning from summer to fall with darker colors and richer textures including velvet (see, velvet again!) & leather. This is a comfortable, yet stylish must-have for your closet. Top Handle Handbags ­­– While these types of bags are pretty much always in style, they are trending BIG this fall season. Top handle bags serve up chicness and versatility since you can carry them by hand or further up on your arm. They always looks cute! Berry – Berry is ‘the’ color trend for Fall 2016 fashion. Deep purples, plums, and raspberries are all the rage this season. These rich hues look great on pretty much everyone so I recommend that you give this one a whirl too. Panic attack averted! So now you’ve got a pretty sound foundation to start planning your fall looks with this season’s most exciting trends. If you still feel a bit anxious about how to pull these looks together, remember that you are NOT alone. As your Personal Stylist, I’m here to help! I can develop customized looks for you virtually, provide personal shopping services, event styling and more! Got style questions? I’ve got answers! Call me at 877-855-8953 or connect with me here.